4-Ingredient tapioca crepes with cheese is a quick, gluten-free breakfast/snack dish that is very popular in Brazil. Since so many people expressed curiosity about Brazilian breakfast customs, I decided to write a post about breakfast in Brazil. 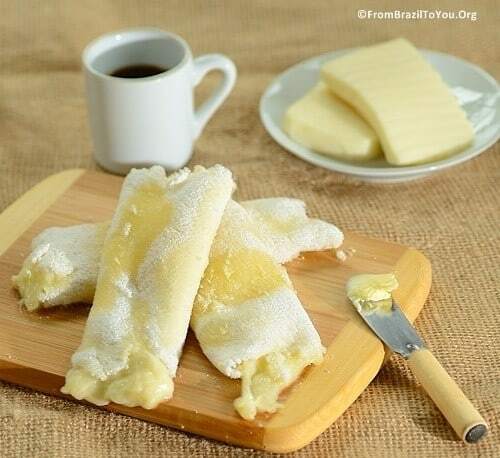 I am also sharing with you my favorite Brazilian breakfast dish: Tapioca Crepes with Cheese or Tapioca com Queijo. I will start out by saying that breakfast is served only once per day, usually between 6 and 8 am. Practically speaking, in Brazil there is no such thing as brunch. Most of the time Brazilians eat breakfast at home, or sometimes have a light breakfast at the padaria (bakery) on the weekends. Since the majority of restaurants there serve only lunch and/or dinner, up until recently there was no such thing as going out for breakfast. But what if we are traveling within Brazil, what do we do about breakfast then? No problem! Hotels normally serve a plentiful breakfast, which is included within the hotel fee. Brazilian breakfasts also tend to be on the lighter side, since lunch is our main meal. So, if you are staying at someone’s house in Brazil, generally do not expect to see pancakes or waffles. Well, not even a variety of cereals. and sometimes hot cocoa or fruit smoothies (avocado, banana, guava, or papaya). … including requeijão — a mildly salty, silky-textured, spreadable cheese sold in glass jars and eaten on bread. Further, you may encounter cold cuts (deli ham, smoked turkey, or salami) and coffee cakes such as orange, plain carrot cake without topping, or cornmeal cake (bolo de fubá). Cereal is not quite as popular, but some Brazilians do like granola. In hotels, depending on how many stars they have, the options can be endless. Many items typical of an American breakfast are available there, and/or several regional dishes. The wide selection of fruit available at the breakfast stations of high end hotels impresses tourists, and definitely has to be experienced. In padarias (bakeries), the most popular items are café pingado (a cup of coffee with a touch of milk) and pão na chapa (half loaves of French bread toasted with butter on a hot griddle). You may also find misto quente (grilled ham-and-cheese-sandwich). as well as cookies, German coffee cakes (cuca de maçã and others), and tapioca crepes with butter or filled with cheese. I am from Pernambuco state in the Northeastern region, where tapioca is a must for breakfast and also for afternoon snack. Our tapioca (or tapioca nordestina) is a tapioca crepe usually served at breakfast time either with butter or filled with cheese, or with a variety of savory or sweet fillings at afternoon snack time. Tapioca crepes are a quick, gluten-free dish made from tapioca flour, water, and salt that is served either for breakfast or as a snack in Brazil. 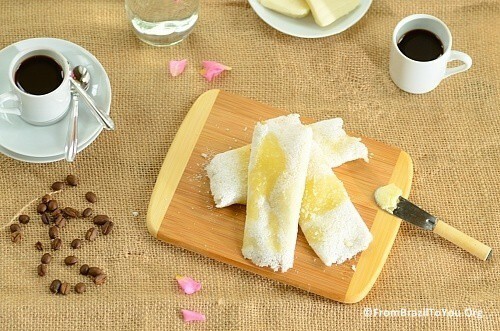 Alternatively, use sour starch or polvilho azedo, a byproduct of cassava to make tapioca crepes. Tapioca itself comes from our indigenous heritage. Since tapioca de queijo (tapioca crepes filled with cheese) is my favorite breakfast item, I will leave you today with its recipe. 4-Ingredient tapioca crepes with cheese is a quick, gluten-free breakfast/snack dish very popular in Brazil. Combine the flour and salt in a small bowl and sprinkle the water on top of the mixture uniformly. Stir well using one of your hands so that the flour gets moistened but doesn’t form a uniform liquid slurry. Then using the tips of your fingers, gently rub the wet starch to obtain a loose, crumbly texture (similar to a streusel mixture). Heat a small (5-1/2 inches diameter) non-stick skillet over medium-high heat. Place the wet tapioca flour in a small sieve. Use one hand to hold the sieve over the skillet and the other to press/rub the starch through the sieve. Strain starch in such a way that when it falls into the pan from the sieve it forms a uniform circle. Let the heat bind and glue the grains so that the starch solidifies and forms a crepe/tortilla (pay close attention, because the crepe/tortilla will be ready in 10-30 seconds). Make sure that the edges have as much starch as the center, so that edges will not be prone to breakage.Flip the tapioca over using a metal spatula (or with experience, a large spoon) and cook very briefly on the other side, or simply slide the tapioca crepe onto a plate. Place on a plate, spread butter on both sides of the tapioca crepe, fill with shredded cheese, roll the tapioca crepes up (like an enchilada, or if desired simply fold it like a taco), return to the skillet, and let the cheese melt. Remove from heat and serve immediately. 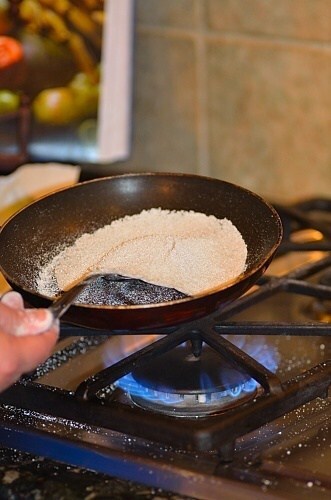 NOTE: Between making one tapioca and the next, please remove the skillet from heat and wipe both the bottom and sides of the skillet clean with paper towel (being careful to not burn yourself), so that the next tapioca won’t be browned by the singed leftover grains of starch. Polvilho Azedo/ Sour Starch/ Almidón Agrio is available at local Latin Markets, Brazilian Stores, and online. It is naturally gluten-free. Storage: Once cooled, the non-filled tapiocas may be stored in sealed containers to be used later as canapés (called beiju); however, they won’t be soft like when they were first made. I personally am not fond of beiju (hardened tapiocas) but you are welcome to form your own opinion. Oh Denise, this is all so interesting! I love to hear about the customs of other countries. We tend to thing everyone lives like us but that is definitely not true. These tapioca crepes sound wonderful and you photos are so pretty! Thanks a lot, Chris! You are always so nice…Yes, customs are something that vary from country to country definitely. Oi, Sally! Fiquei super feliz com a sua visita!!! Não tenha medo não. É fácil de fazer sim. Leia toda a receita antes de fazer e siga passo-passo que dará certo. Você verá que é tão fácil e simples de fazer que vez por outra ficará tentada a comer essa delícia do meu nordeste. Meu marido americano e filha mais nova adoram tapioca. Vez por outra tenho que fazer aqui em casa e matar as saudades. Se tiver qualquer dúvida é só perguntar! Um abraço. Denise – I love learning about different cultures and the Brazilian breakfast rituals sound a lot like Bangladesh. Thank you for sharing, my friend. You know crepe is my all time favorite, right? I can have them for breakfast, lunch and then for dinner again. Thanks, Lail! How interesting…I had no idea that Bangladeshi breakfast habits were similar to ours. Love it! WOW! What a delicious breakfast! I love it!!! Thanks, Roseli! I am so glad that you are visiting me here. Que legal! Eu adoro beiju!!! 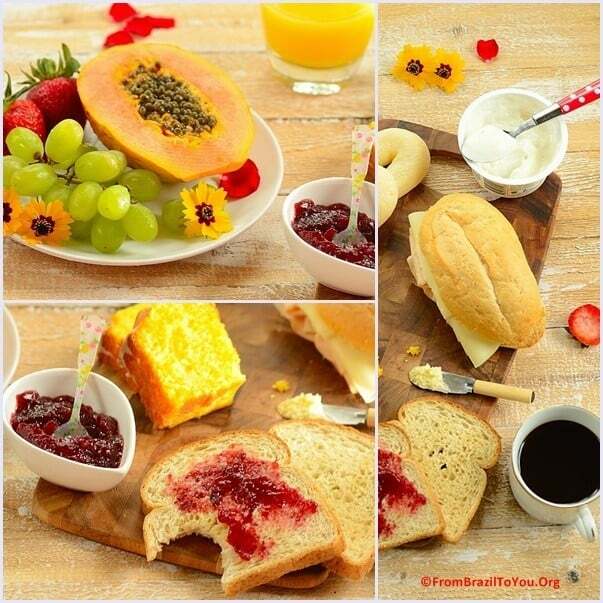 Ohhhh…I want to wake up at your home to have this fantastic breakfast…!!! I think it’s only in America that we find pancakes, waffles, doughnuts…all things sweet! Indian breakfasts are mainly savoury too with a bit of sweet to balance. English breakfasts are always savoury too with just jam being a bit sweet. I always crave savoury stuff for breakfast myself, mainly croissants or French bread. I am fascinated by your tapioca creeps, bu I have to ask, do they taste sour? Or is it like a sourdough taste? I am trying to imagine it, especially tapioca in sour form! Nazneen: Although its starch is called sour starch is not really sour. The taste is quite mild. They call sour starch for 2 reasons: First, it is because this starch has undergone to a fermentation process; Second, it is to distinguish from another tapioca starch that have not undergone to the fermentation process. Don’t worry! 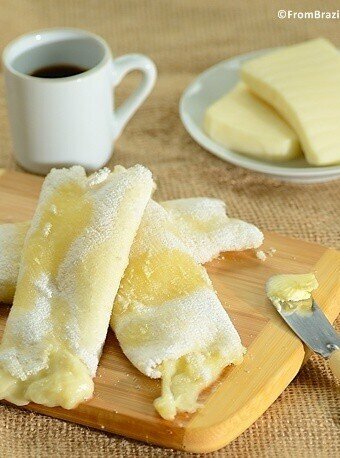 These tapioca crepes are pretty mild and gets the taste from the butter and melted cheese. Thanks, Nami! It may exist more than one culture that makes these crepes but so far I just know about the Brazilian one. It is a very typical dish from Northeastern Brazil. I enjoyed learning about Brazilian breakfast customs! And the Tapioca Crepes are just delightful! Beautiful breakfast! Love that serving papaya fruit is traditional for Brazilian breakfast – I love papaya! Thank you for the crepe recipe – I make quite a lot of crepes myself, but regular ones, not with tapioca. Tapioca crepes texture looks very interesting! Thanks a lot Pooja! I am glad that you like my blog and food photography. I hope you can visit it again. Wishing you a great weekend! Oh, my. I could eat a Brazilian breakfast 3 times a day! And these crepes would definitely be on my menu…love that gooey cheese!!! Looks like the Brazillian way of breakfast is similar in the Philippines, we also do take it at home with some tropical fruits and coffee without milk. This tapioca breakfast of yours looks amazingly delicious, just look at that melting cheese. oi denise… depois de alguns anos morando aqui nos usa, sentia muita saudade da nossa tapioca,sou nordestina!! Encontrei nos supermercados daui na marca Bob Red Mill, tapioca flour. Eh uma delicia!!! Olá, Patricia! Que bom receber a sua visita. Fico contente que você haja encontrado facilmente uma marca que você gosta. Nas minhas tapiocas, eu sempre uso polvilho azedo ao invés de polvilho doce (tapioca flour) pois o gosto é mais similar ao da verdadeira tapioca. A marca que uso, Yoki, pode ser facilmente encontrada online em Amazon.com e também em supermercados latinos. Tenha um bom fim de semana e volta sempre. Um abraço!!! Ola tudo bem ? Moro nos Estados Unidos e aqui em cape Cod e bem dificil encontrar as coisas boas no brazuilian market, vc acha que da pra fazer a tapioca com a Red Mill tapioca Flour ? Obrigada! Fico contente que você haja gostado do meu blog. Seja bem-vinda! Espero que você nos visite mais vezes. Eu nunca usei a tapioca flour do Bob Red Mill assim que não saberia dizer se funciona ou não. A farinha de tapioca que uso é o polvilho azedo ou sour starch, o qual poderá ser encontrado online em Amazon.com: http://www.amazon.com/dp/B005CBRPIW . Tanto o gosto quanto a textura é diferente da do polvilho doce ou tapioca starch. Se você chegar a fazer a tapioca nordestina usando a farinha do Bob Red Mill e der certo, por favor me avisa. Um abraço! 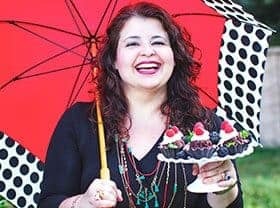 oi Fernanda, a tapioca Flour é semelhante a algum polvilho ou a farinha de tapioca nordestina? Não sei se essa pergunta é pra mim ou não mas vou responder. A tapioca flour é o nosso polvilho doce usado pra fazer bolos. Já o sour starch é a farinha de tapioca ou goma para tapioca nordestina, a qual apresenta uma textura mais grossa. Denaaaaaa!!!! Que maravilha de post!!! Amei! Digna de ser matéria para aula de cultura brasileira para estrangeiros. Oh, Ninha…Obg, amiga!!!! Fico feliz que você gostou do texto e que as fotos te deram fome. 🙂 Saudades. Bjs. My tapiocas keep getting hard when I make them, am I just over cooking them? Tapioca crepe , just like risotto, is one of those dishes that you have to eat immediately. If you make tapiocas and store in a sealed jar, they will become hard and transform to what we call beiju (similar to a hard taco). I am one of those people that dislike beiju. If you follow the process (and measurements) they will be right and soft but please eat them immediately or they will become hard. As soon as the tapioca is formed and you can flip it to cook the other side for a few seconds (3-5 seconds), remove them from the skillet, spread butter while it still hot, and serve. Or follow the process described with cheese. As you see, you cannot cook them for a long time. Aditya: Thanks for trying this recipe. Unfortunately, I have never tried to make this recipe with mocaf. The fact that it is also fermented and gluten-free does not make mocaf suitable for this recipe. The sour manioc flour/starch has an elasticity given by the cassava and is high in starches. These might be elements that mocaf lacks. If tapioca flour is available in your country, you can use it to make this recipe. The only thing is you will have to soak the tapioca flour in water and leave at room temperature to evaporate the water, resulting in slightly wet flour. Then, you can make the tapioca crepes according to the directions of the recipe. Essa farinha pode ser encontrada em mercado latino??? ?ou so posso usar esse encontrado no Amazon??? O sour starch (ou polvilho azedo) pode ser encontrado em Brazilian markets ou na Amazon.com. Há outras lojas de produtos brasileiros online que também vende. Alguns Latin markets também vende mas não todos. Lembra que o polvilho azedo é diferente do polvilho doce (ou tapioca starch). Quando você for comprar, compra o sour starch pois é muito mais fácil de fazer a tapioca e o gosto é muito similar. Se você tiver alguma dúvida, é só perguntar. Um abraço! Mas, e ai’ se eu fizer com polvilho doce? sai ruim? Você poderá tentar fazer com polvilho doce. Eu fiz uma vez e saiu direitinho mas terá um pouco mais de trabalho e também terá que molhar o polvilho doce de pouco em pouco até ficar um pouco enpelotado (lumpy). Deixe descansar por uns 5 minutos e depois passe pela peneira com ajuda de uma das mãos seguindo o mesmo procedimento descrita na receita aqui. Dependendo do recheio, será necessário ou não colocar sal na massa da tapioca antes de fazer. Quando eu receheio com manteiga salgada e queijo (porque já é também salgado), eu não coloco sal na minha massa. Mas aí depende da sua preferência. Esperoq eu dê tudo certo com o polvilho doce. Um abraço!!! Um Feliz Ano Novo p vc! De nada, Cristina! Pra vc e sua familia também.